DCU president Brian MacCraith said upon the announcement that the investment by Minister for Education John Bruton was a “timely and important capital investment”. DCU have been granted a €24 million investment into a STEM facility by the government, which has been welcomed by DCU President Brian MacCraith. The Department of Education and Skills announced on September 14th of this year that they would be funding a new ‘state-of-the-art’ STEM hub on the DCU campus as part of a €50 million overall Future-Tech investment. “This welcome development will significantly enhance the learning experiences and opportunities for thousands of students pursuing STEM-related careers,” MacCraith said. “The new 10,000 m2 ‘Future-Tech’ facility is a €50m project that will further advance DCU’s international reputation for excellence in science, computing and engineering disciplines, with a capacity to accommodate over 3,000 additional STEM students on the university’s Glasnevin campus,” he continued. This new facility is planned to accommodate degree courses under the subjects of science, technology, engineering and mathematics and is expected to begin construction in the near future. “The Future-Tech facility will accommodate degree programmes and research in key areas such as data science, internet of things, and sports science and technology. Upon completion, Future-Tech will also serve as a beacon for collaboration with the local, regional and national economy,” MacCraith said. The facility will be located on DCU’s Glasnevin campus at the main entrance and believed to take up to two years to be completed, with the first students being accepted in 2121. The facility is also expected to accommodate over 3,000 additional students, along with housing DCU’s School of Health and Human Performance. “The Future Tech building addresses key skill needs and is aligned with the strategic objectives for DCU and wider third level sector. DCU is also experiencing capacity constraints and is at, or close, to capacity in many key STEM areas, including undergraduate computing courses and the BSc in Engineering. 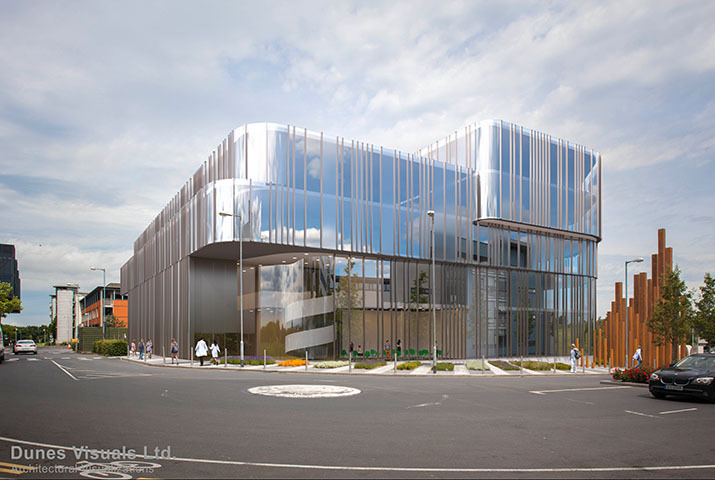 The Future Tech Building will deliver an increased capacity for over 3,000 students,” Minister for Higher Education, Mary Mitchell O’Connor told The College View. “The Future Tech Building will benefit students by facilitating expansion of student numbers in the Faculty of Engineering and Computing and the Faculty of Science and Health. There is a shortage of professionals in these areas and employment opportunities are continuing to grow,” she added. Speaking to STEM students in DCU, they had conflicting views. “Having a STEM designated building will really help with certain aspects of the science courses in DCU in the future,” said third year genetics and cell biology student Sinead McQuirens. “The building would be a great benefit to the courses but it is a pain the constant construction going on in DCU, it feels like as soon as one building is done another one is starting,” she added. “Anything that’s going to improve the courses and improve the stem subjects is a good thing and if you have to have another building to do it, so what it’s fine,” said Michael Kelleher, a second year engineering student.